The New York Knicks’ rich history includes six of the 50 Greatest Players in NBA History: Patrick Ewing, Willis Reed, Walt Frazier, Dave DeBusschere, Earl Monroe and Jerry Lucas, but did you know that it can also be linked to Washington Irving and the Dutch settlers? Knickerbockers debuted on November 1, 1946, edging the Toronto Huskies, 68-66. The Knicks are one of only two teams of the original National Basketball Association still located in its original city (the other being the Boston Celtics). In the 2013-14 season, the Knicks were named NBA’s most valuable team grossing in at $1.1 billion USD. From the very beginning, the Knicks home uniforms are in white with blue and orange trim, while the away uniforms are in blue with orange and white trim. The term “Knickerbockers” traces its origin to the Dutch settlers who came to the New World – and especially to what is now New York – in the 1600s. Specifically, it refers to the style of pants the settlers wore… pants that rolled up just below the knee, which became known as “Knickerbockers”, or “knickers”. The name became synonymous with New York after Washington Irving wrote a satiric A History of New York from the Beginning of the World to the End of the Dutch Dynasty (published in December, 1809) under the pseudonym Diedrich Knickerbocker. The book was later known as Knickerbocker’s History of New York. 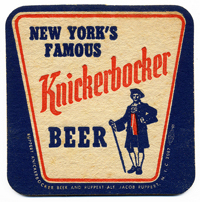 Soon after, the term “Knickerbocker” became linked to anything and everything New York… from Broadway musical Knickerbocker Holiday to Jacob Ruppert’s Knickerbocker Beer [photo below]. Father Knickerbocker became the city’s most popular symbol of the late 19th and early 20th centuries, complete with cotton wig, three-cornered hat, buckled shoes, and, of course, knickered pants. The final decision to call the team the “Knickerbockers” was made by the club’s founder, the legendary Ned Irish. The first logo of the New York Knicks is of a character named “Father Knickerbocker” dribbling a basketball, in the iconic blue and orange colors.